Feedback: 47 comments - leave yours! One of the most popular desserts in Turkey is Tavuk göğsü, made with chicken breasts pounded with sugar, thickened with rice flour and dusted with cinammon. I immediately recognized this dessert as a long-lost relative of a European medieval hit. See how I cooked this dish following a 14th century French recipe during my week-end at Hattonchâtel castle in France. Start by boiling a good chicken in a large pot water. Flavor with onion with a bay leaf nailed on with a clove. 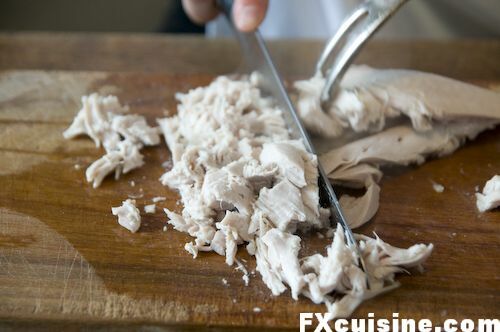 After an hour, slice open the chicken and remove the breasts to a chopping board. 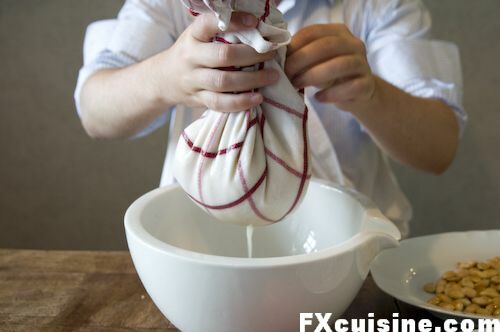 Pound a pound of shelled and skinned almonds to a pulp in a mortar and place them in clean cotton towel inside a bowl. Pour two cups of the chicken stock on top and let steep for a few minutes. Pull up the cotton towel and strain until all the juice is out. The water has turned white as milk, almond milk. 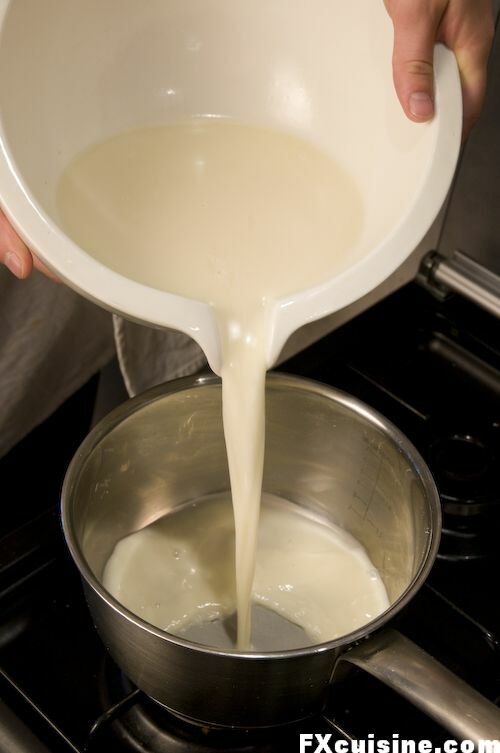 Pour the almond milk into a saucepan. 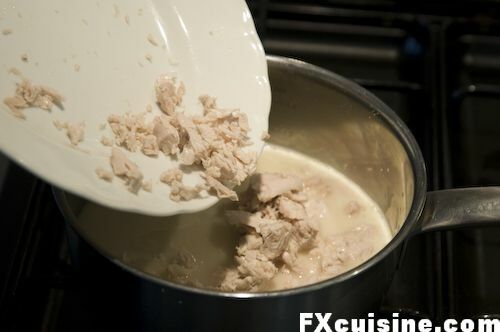 Add the chicken breast and thicken with a small glass of rice cream (equal quantities of water and rice flour). Add as much sugar as your taste will allow and mix. 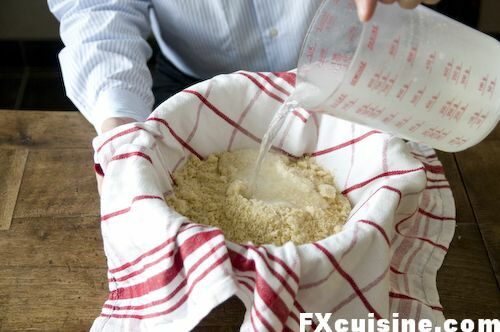 As soon as the rice flour has thickened the pudding, pour it on the serving dish. Try to keep a smooth surface on top. 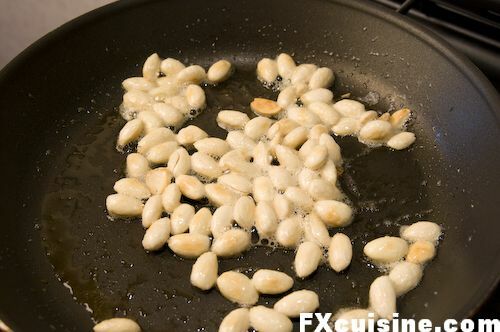 Fry a few shelled and skinned almonds in a little butter until they turn pale brown. Adorn the dish with the almonds. This is a simple dish with a 2000 year old ancestry so don't overdo it - simple is the way to go. Cut a pomegranate open and spoon the seeds out. 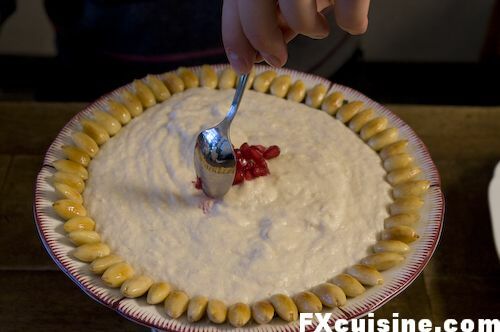 Sprinkle the pomegranate seeds on top and serve. Here you see a section of the dessert table we made at Hattonchâtel castle. Clockwise from the bottom left, Madame Cremel mirabelle tart, the medieval blanc-manger and the modern French-style blanc manger. I'll show you how to make that one next week. Our dessert looked very appealing with the ruby-like pomegranate seeds and the crown of roasted almonds. You really feel like a piece of history is on the table. I told the guests The bishop of Verdun, whose house this was for 800 years, ate the very same blanc manger you are about to taste. This was a staple on the medieval table. They all came and tried this ancient novelty. Don't do this at home - chicken and sugar do not agree with our 21th century palates. I made it so that everybody could see the long history of the dish and appreciate the unique dining experience in this thousand-year-old castle. Next week you'll see the modern blanc manger, a much better dessert altogether. This dish lives in Turkey nowadays as Tavuk göğsü. The Turks kicked the almonds but kept it white with rice flour and chicken breasts. In upscale restaurants the pudding is cooked in a copper pot until a thick brown crust develops at the bottom. The dessert is very sweet and served sprinkled with cinammon. If you want to give chicken for dessert a chance, try it in Turkey. And please don't miss my article about really serious modern blanc-manger next week! Honestly, I had never thought I would see chicken in a dessert! It would be an interesting experience, to say the least! The mirabelle tart looks tasty! What is on it? I LOVE THIS! When we visited Turkey a few years ago I got addiected to Tavuk gogsu. I t is a weird but marvelous combination and thank you for the recipe. I will try it soon! I seem to remember there are some Moroccan dishes with sweet chicken, too. The combination of sweet/savoury tastes is an interesting one and I wonder whether we should explore it more often - for instance 'flao', a lovely tart you find on Formentera in the Balearics, has mint, cheese and sugar - is it a savoury first course or a sweet dessert? I've never quite managed to make my mind up! But then I freely admit to being a food deviant - I like my breakfast sausages with marmalade. I'm glad you included the caveat "don't try this at home!" On a visit to Turkey I'd sample the chicken dessert but I think you're right in that the 21st century dessert palate is not adapted to such flavors. When completing a meal, my tastebuds are anticipating sweet flavors - with the most savory meal-ending tidbit being cheese. When I saw the title of this entry, I thought, "Oh, this is like pancakes for dinner." Except not! What a fun curve ball :D Thanks for keeping it interesting. I have that recipe in one of my books and I've always wondered what it should be like... Interesting, but I'm sure it's an aquired taste! The brown crusted version is called "kazan dibi." They are not always done from the "tavuk gögsü". So do make sure you ask for "kazan dibi" that is made from "tavuk gögüsü." 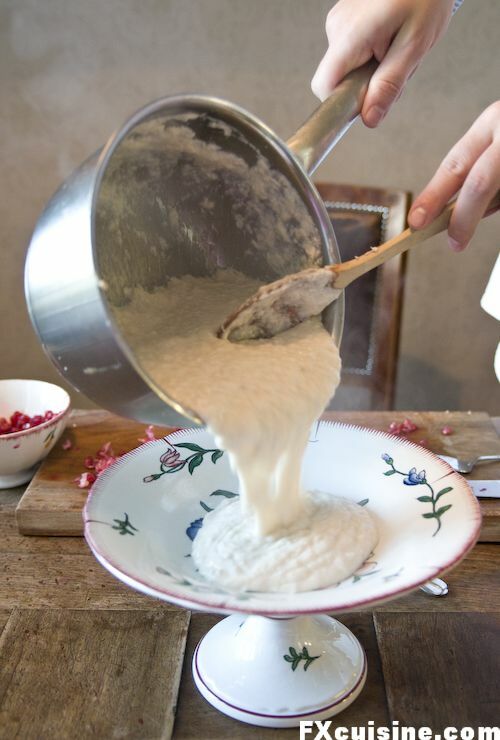 "Kazan dibi" means the bottom of the pot, and may refer to the bottom part of any desert made from milk. If I am not mistaken, the whole purpose of adding chicken, is to introduce protein, which forms a basis for milk to stick, and hence give consistency. I read somewhere that the Italians used boiled and then crushed fish bone for the very same purpose in their panna cottas. Great article as usual.A couple of points regarding Turkish version(tavuk göğsü); thechicken should be boiled without any spices with minimum amount of salt to retain flavour.Breasts should be cooled in stock then taken out.Meat is never ever to be chopped,they are either pounded into a malleable consistency or hand worked in absolute cold water into chicken floss. This depends on the cooks preference. İf you don't do this, outcome will be a gruel like dish. Almond milk or sumata according to old custom should not be omitted, otherwise the dessert becomes "yalancı tavuk göğsü" roughly translated as fake tavuk göğsü, acceptable product, nevertheless not the original item.Almond milk sometimes substituted with "sübye"-not to be confused with Turkish namesake cuttlefish.Sübye is melon seed milk and prepared very much like the almond milk. It is sold as a summer drink in costal towns like Izmir. 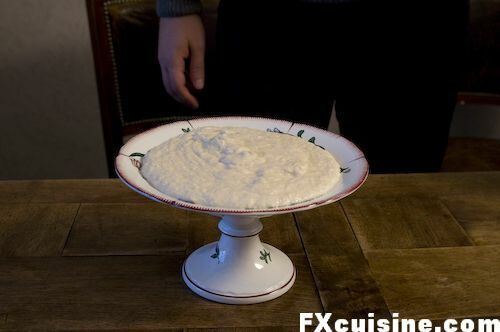 Sübye alone can thicken and jellify the dessert without rice flour.Finally the final product is spread half an inch thick cooled and rolled.There is a debate amongst the purists whether to add vanilla or not into the milk. 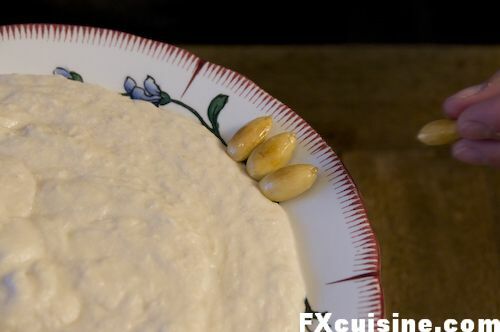 Generally milky puddings in old cuisine cooked without vanilla to remain pure and simple.Tavuk göğsü should have a consistency of melted cheese on the spoon and you should not taste the chicken at first bite it should arrive much later, thats the proof of the pudding!over and out before sounding a bore.thanks again. I do not see in the recipe any sugar or sweetener of any type other then the pomagranate? I attended a dinner recently where one of the desserts was made from chicken, so when I saw the name of your post I thought this might be a (hopefully better) version of that dish. While yours is different, it actually looks appetizing! Hello Francious, I am always fascinated with your blog updates. They are the most interesting, original and culturally accurate blogs I have ever had the pleasure to read. I don't know were you get these ideas but I must say each and every one of them are extremely interesting and unique. Chicken as a dessert in something I could never imagine possible! Hope you and your loved ones are doing well. Thank you for all the work you put into your blogs. God bless you. Thanks Carmen, I have always been interested in novel ways of approaching life, and ancient recipess definitely give a fresh angle on things. Glad you like it! Fearless Kitchen, indeed you must be fearless to try the medieval version, I think the Turks got it right. But wait until next week and you'll see the modern French blanc-manger, that's something! Roberto, the sugar is a tricky thing. You need to add it after the chicken, but how much is the real question. 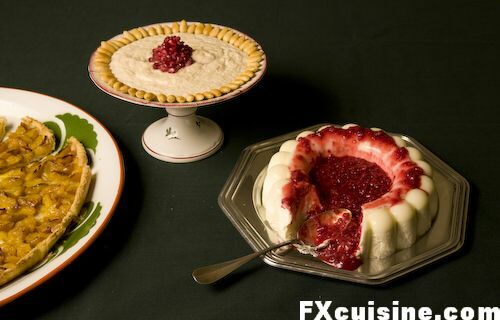 Too much and it really becomes a dessert with a chicken taste, little and it some strange savory pudding. But the middle ground makes the strangest and least appetizing version! Ayan, thanks for the detailed background on traditional tavuk göğsü, this is information I had been looking for in many books but could not nail down. If I come back to Turkey I'd be very interested to visit somebody who makes it in the traditional way. Would you know where I should look? Ahmet, I have to look into the italian crushed fished bones. It's fascinating that in French we call the top part of a baked dish, that delicious brown crust, by the word of "gratin", which also means the upper crust of society. And in Turkey it's the same but with the delicious crust that forms at the bottom of the dish! Rosa, glad I could try this so you don't have to and wait for the better recipe next week! Chiffonade, in fact I think you might like the Turkish version as it is completely sweet and not in the least savory, with a rather faint chicken taste. Obviously when you know what's inside, it makes for a rather surprising match! 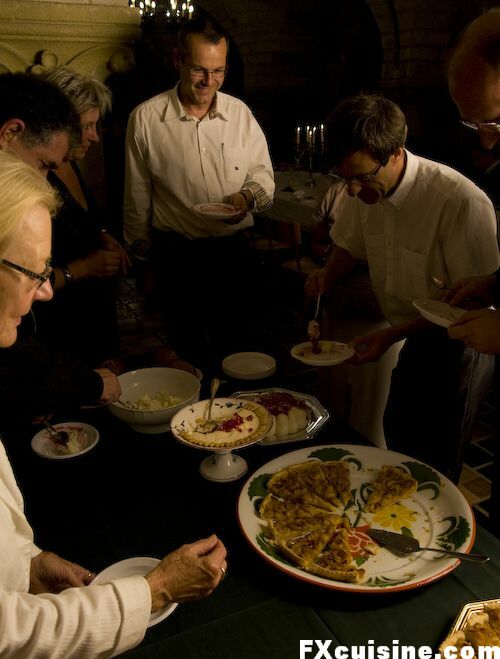 Andrea, you can look at my article "Marakech Cooking Class" for a preparation of pigeon pastilla with loads of sugar. 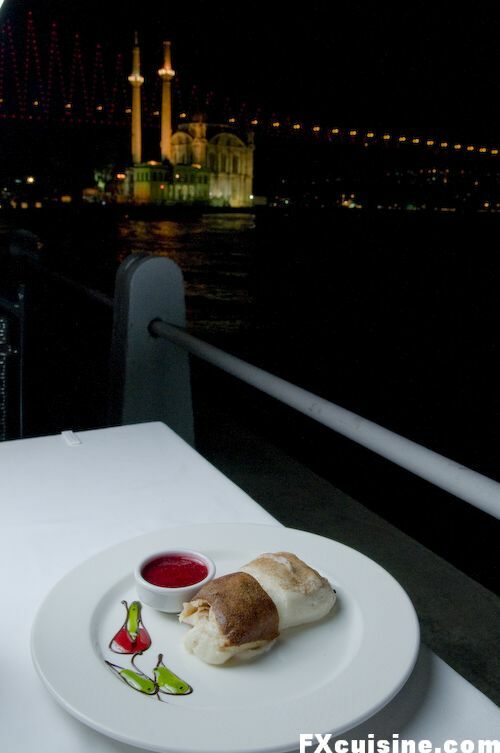 I think the "flao" you mention looks very much like the dessert in my article Istanbul Ramadan Kebab, made from some unsalted cheese and sugar! Food Junkie, you might not like the results of the medieval recipe, perhaps it would be best to use modern Turkish recipe for Tavuk Gogsu if that's the one you like! Babyg, the mirabelle tart was delicious, but nothing was on it. Just pastry, mirabelles and sugar! Please don't miss my next article he says, HAH fat chance of that happening! Keep up the awesome articles and photography! Fantastic and so interesting, as usual. I love your website! This is a dessert I grew up with - not to mention one of my favorites. My father was Turkish and my mother learned to cook this from his mother. I remember telling friends as a child to come over to try "chicken pudding" (as we called it) and how horrified they were. We never had it with almonds though - more so with cinnamon. I have to say I am disappointed that you didn't like it. Perhaps it wasn't a good batch or recipe... bc for a child with picky taste to love it... it had to be nothing but warm gooey sweetness! You should give another recipe a try - don't give up on it. This is very different! I can't tell if I'd like it but the plate presentation is beautiful! FX, not sure that you don't have the tail wagging the dog on this one-- i.e. I think that the "medieval" version of the dish is an interpretation of the original Turkish dish brought back to Europe during the crusades/spice trade/saracen contacts. Historically, I this would make the most sense but I am curious what others have to say. I have only seen the Turkish version of this dish in my cookbooks, never the western european version. Anyway, I'll preffered wild board carpaccio!!!!!!!! Meats in dessert? Well, it's not for me. Mirella, oh know the tail is firmly in the back of the dog on this one. There are dozens and dozens of European medieval recipes for blanc-manger. I think the common ancestor was a Roman recipe but as I could not find a precise reference nor any mention of it in Apicius, I left this out of the article. Hillary, check back next Friday for the other blanc-manger, it looks just as nice and tastes better! Shu, the Turks make one with chicken and sugar that tastes good even today, although it remains a little strange. Natalie, if you read carefully you will see this is a medieval recipe I made, which you most probably have never tried since it left cookbooks in the 1850s. The Turkish version is different and I like that one. Demelza glad you liked my article and hope to see you back here! Vatsal, glad to hear you are hooked on FXcuisine! MYA good luck with your exams and rather try next week's recipe for blanc-manger, much better! I always loved this since I was a little boy but I was really amazed when I learned that they actually put chicken in it. I am sure, most of all won't get the chicken taste if it wasn't called chicken breast. Utkun, thanks for visiting, I thought you might like this article! I absolutely love your blog! It has really showed me the cuisine from the other side of the world! (I am from Singapore). Will you be going to featuring more asian cuisine in the future? FX's answer→ Pearl, thank you, unfortunately I do not know much about Asian cuisine but as soon as an opportunity to explore it comes up I'll be sure to publish some articles. The main problem is that the most serious books are written in languages I can't read (Chinese, Japanese, etc...). Very interesting and I enjoy the devotion to history. Though advised, "Don't do this at home - chicken and sugar do not agree with our 21th century palates." I would still like to try this. Just for the fun of it. Hi, I saw your very interesting article about historical blacmange and I was hoping we might be able to have a chat for a documentary programme we are currently making for BBC1 about the history of food. FX's answer→ Kirsty, we chatted about blanc-manger the other day, when your documentary is broadcast could you please drop me a line? I absolutely MUST "try this at home." I belong to the SCA, and "Lady Catherine" has invited us for a potluck 4th of July. I'm bringing this dessert. But, blame the show "Master Chef." I'm cooking up scenarios as if I'd be on the show one day. FX's answer→ A fair point Diana!